Following our post last week featuring exiled South African bassist Harry Miller here is another long forgotten gem from Dudu Pukwana's catalogue, named the album Sondela which is credited to the group Atte - The Sound of South Africa. 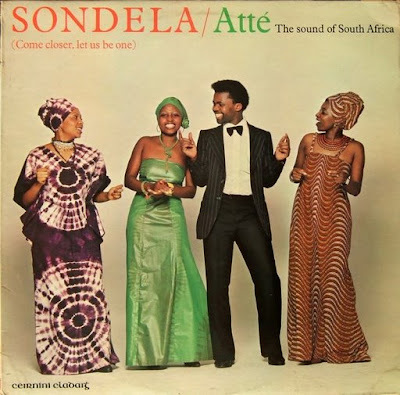 Released on the Irish label Claddagh Records back in 1977 this features the likes of Dudu Pukwana (keyboards, alto sax), Churchill Jolobe (drums, percussion), Ernest Mothle (bass), Sello Josh Makhene (convos), Frank Roberts (keyboards) and vocals from Sonia Lekhela, sisters Lindiwe and Tiny Conco and Mphiwa Yengwa. An impressive discography of Dudu Pukwana can be found at the Wall of Sound blog here. Thank you for this new LP and the link for the discography. I really love Dudu Pukwana and all that south african jazz. You really make, here at Electric Jive, a wonderful job. Thank you again! By the way, did you know this swiss band ? I saw them in concert in September in Geneva and they were rather good. Thank you for this gem, Matt. And blessed be the day when I discovered this place !! Never heard of this gem. Folk song 'Sithi Gwasa' (correctly, Gwaza) takes me all the way back to my toddler days. Only now do I understand that the song was actually about fighting back against colonial oppression epitomized through apartheid. Never knew the song was ever recorded. Most of the others were popularized by the legendary Miriam Makeba. One wonders just how much of these golden sounds lie buried somewhere waiting to be unearthed! Long live EJ! Just a few words to thank you for some great music I found here that I didn't know I was looking for. I didn't know there was great black music outside the U.S.A. ! Many thanx from Dijon, France. Re: non-U.S. "black music". Most of the Nigerian, Ethiopian, etc bands are on French releases, never mind from South-Africa, Mali, the list is endless, what about Jamaica ?? Mankunku, Fela, Malatu,...go listen & go visit a Paris record shop as you're lucky enough to live where so much of it is produced.